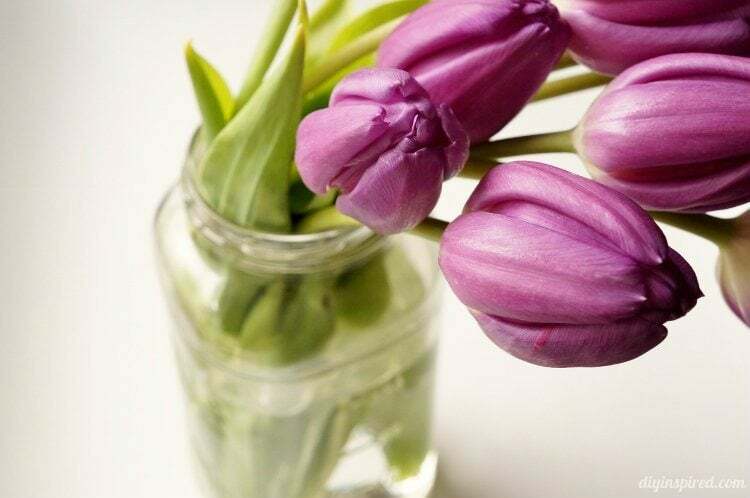 It’s mid spring which means that tulips, one of my favorite flowers, are typically available in flower shops and grocery stores. My best friend loves them too, so I thought I’d bring some over to her house after I heard she was having a bad day. When I went to pick out a bouquet, there were so many pretty colors it was tough to decide. There was white, light pink, dark pink, red, and purple. 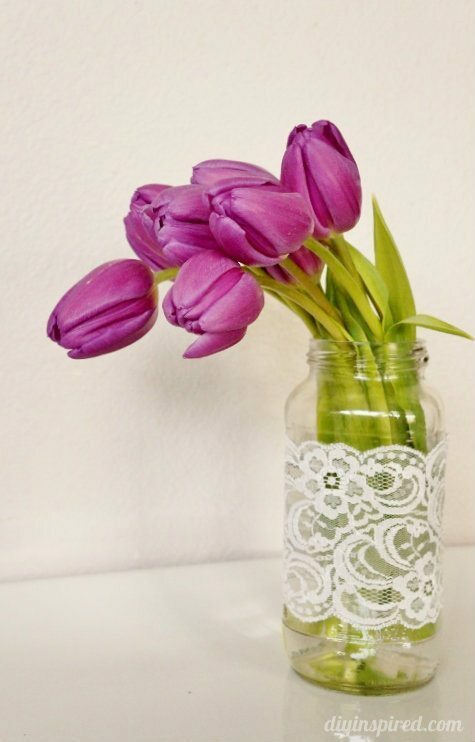 I ended up choosing purple and put together this Mason jar with tulips gift idea. I always keep a few sauce jar handy in my cupboard for occasions like this. I had the perfect one. 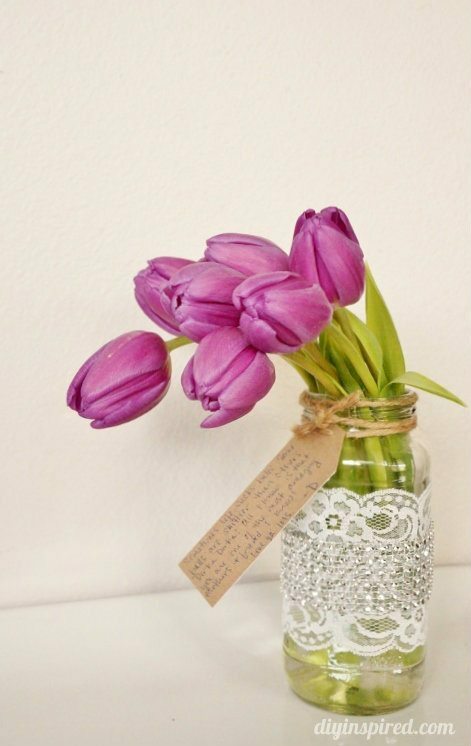 Honestly, I see beauty in the jar on its own, but wanted to make it a little more special for my friend. 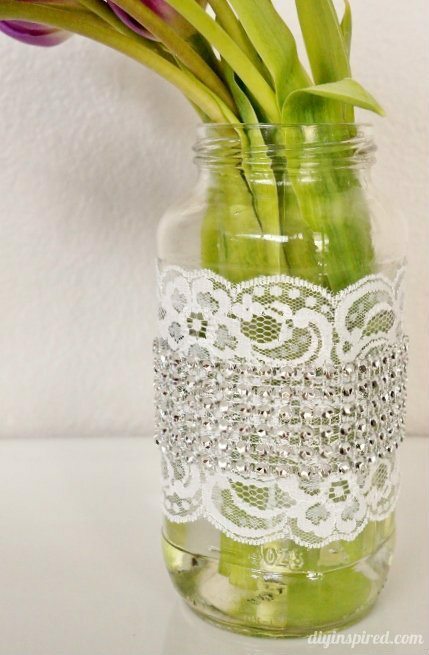 I started with a little lace … simple and pretty. I liked it but continued to dig through my never ending craft supplies. I found some rhinestones . They were fabulous (like her)… perfect. I made a little tag and wrote a personal note on it and tied it with some jute string . It’s a small gesture that took a few minutes. I gave it to her that night and she appreciated my sentiment. I was glad I could put a smile on her face even for just a second.